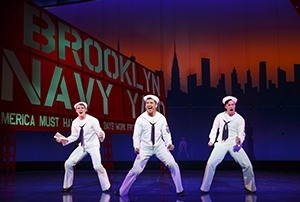 Playgoers who haven't walked away from a Broadway musical beaming since before they can remember should head over to Times Square for On The Town, the 1944 musical which introduced Leonard Bernstein, Betty Comden, Adolph Green and Jerome Robbins. That fabled quartet is no longer with us, but their spirit--and their spirited debut work--is at the Lyric Theatre in sparkling shape. From the moment the three gobs on 24-hour leave slide down the gangplank at the Brooklyn Navy Yard to conquer "New York, New York," this romp of a spree is cookin' with gas. The fun starts three minutes earlier, actually, when a workman out of the chorus--Phillip Boykin, no less, the Crown in Audra McDonald's Porgy and Bess--gloriously fills the vast Lyric with that plaint about how he feels like he's not out of bed yet. 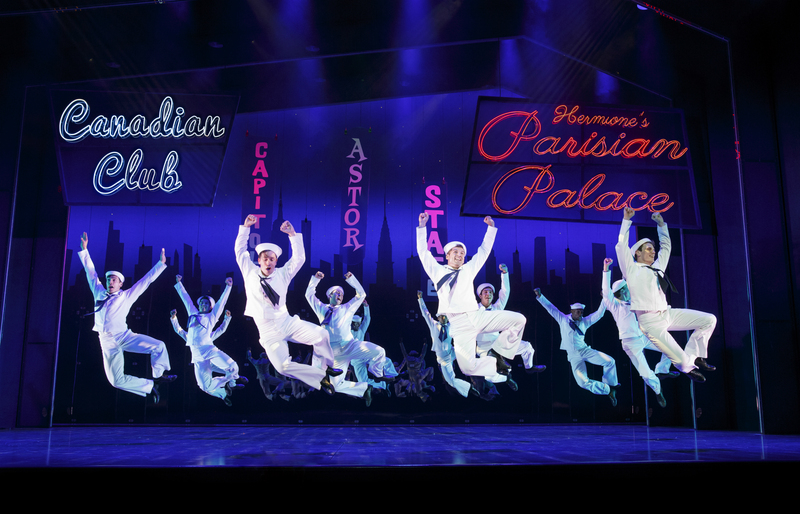 The multiple charms of On The Town seem to have faded over the decades, at least as evidenced by the 1949 M-G-M version (with most of the score deleted) and big-budget Broadway revivals from award-winning directors in 1971 and 1998. The correct approach, it turns out, is to play down all those layers of camp and nostalgia and let Bernstein, Comden & Green speak for themselves. On The Town as written runs the gamut from highbrow (all that "Prokofiev stuff," as original director George Abbott used to call it) to low (a burlesque caveman dance, anyone?). But there's a tender heart at center, typified by "Some Other Time," the song of parting for the freshly-met lovers as the leave ends and the boys ship out to war. Director John Rando (Urinetown) and choreographer Joshua Bergasse (Smash) have precisely the right touch, milking every ounce of fun out of the material while treating it with respect. Bergasse is not quite the choreographer that Robbins was, naturally; but he does well in places and even better in others, reaching the heights in the second act "Imaginary Coney Island" ballet, incorporating "The Great Lover Displays Himself." The producers have wisely invested in a full orchestra of twenty-eight, which makes a big difference in a day when hit musicals make do with nine. (Thirty years back, most musicals--even the lousy ones--had twenty or more players.) Full credit goes to musical director James Moore, who did a similarly stellar job on the recent large-orchestra revivals of Follies and Ragtime. Listeners be advised: this is what Broadway sounds like when you splurge on six violins. (Since the producers don't see fit to credit the orchestrators, let us add that they were Hershy Kay, Don Walker, Elliott Jacoby and Ted Royal.) The producers have also splurged on a ravishing set of colorful costumes designed by Jess Goldstein. Alysha Umphress (American Idiot) and Jay Armstrong Johnson (Hands on a Hardbody, The Most Happy Fella) are twin comic joys as taxi driver Hildy and her sailor Chip. Umphress slays us with "Come Up to My Place" and "I Can Cook, Too," while Johnson manages to generate equal laughs as her sounding board. Elizabeth Stanley (Company), too, is excessively droll as out-of-control anthropologist Clair De Loone, paired with Clyde Alves (The Music Man) as a walking prehistoric specimen. The three men, each adept at the comedy and the singing, also do an impressive job with their dancing. Major comedic support comes from Michael Rupert (Falsettos) and Allison Guinn (Hair), while Jackie Hoffman (Hairspray) overdoes it. The Lyric, for those who are keeping score, opened in 1998 as the Ford, and in the interim has been renamed the Hilton and the Foxwoods. Neither Ford, Hilton nor Foxwoods got much marquee value out of their sponsorship, and London's powerful Ambassador Theatre Group--which bought the lease during the waning days of Spider-Man--has redubbed it the Lyric, in honor of the 1903 house demolished to make way for the Ford. (The rear facade of the original Lyric--a thing of ornate beauty--was carefully preserved and remains in place on West 43rd St.) The venue has had little luck thus far, in part due to its vastness. How the current tenant looks from Row ZZ in the orchestra--to say nothing of the back of the second balcony--is anyone's guess. Even so, this On The Town is a dandy singing & dancing spree. Mr. Green (who died in 2002) and Ms. Comden (who died in 2006) were excessively proud of their first-born--in part because they wrote leading roles for themselves, as the anthropologist and her prey--and were enthusiastic cheerleaders for past productions. This On the Town at the Lyric would leave them tickled pink and leaping for joy.